This is an early version of the modern computer from 1949. 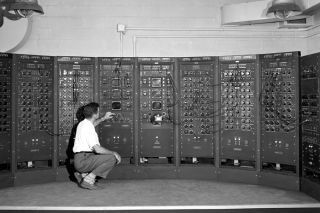 In this historical photo from the U.S. space agency, an Analog Computing Machine in the Fuel Systems Building is shown in September of 1949. This is an early version of the modern computer. The device is located in the Engine Research Building at the Lewis Flight Propulsion Laboratory, now John H. Glenn Research Center, Cleveland Ohio.